Yum yum yum!! Another snack I adore from Mangalore. I can eat goli baje by the bucketful if given the opportunity. 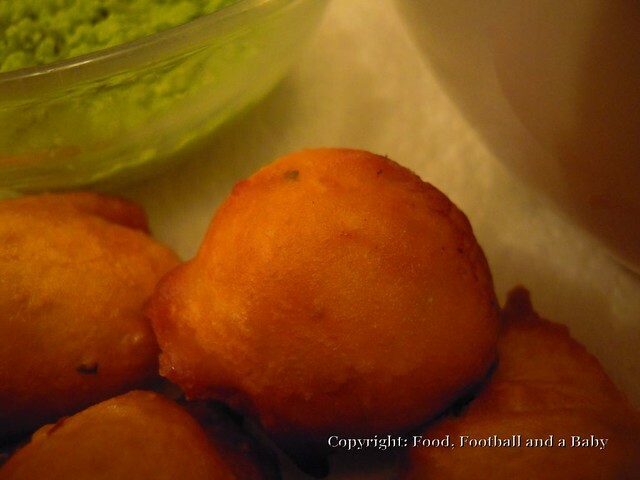 Goli baje are basically deep fried seasoned balls of flour and yoghurt, lightly spiced with some green chilli, ginger, fresh coriander and even curry leaves. The literal translation of the words means, 'round fried snack'. 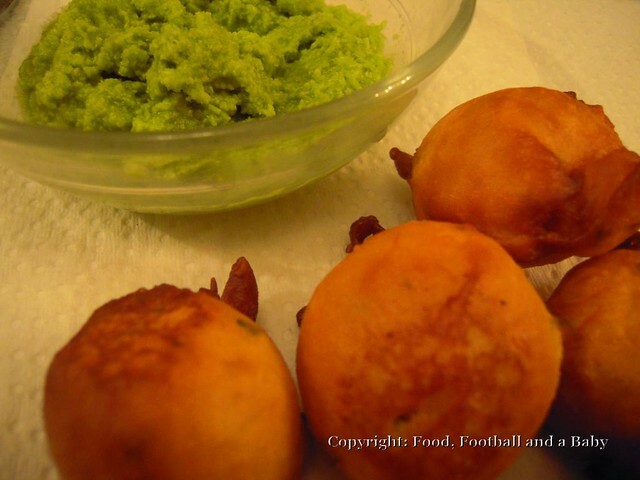 Its famous all around Mangalore, and many a time I have sat in a hotel in the middle of nowhere, sipping strong hot coffee and savouring these mini bites of delight with sambar and coconut chutney, sometimes even with good old ketchup. This is one of those snacks we never really bothered to make at home. I mean, why would we go to the trouble of making up the batter and spending at least an hour over a hot stove when we could just pop around to the local eatery? However, when I moved to England, and subsequently, here to Edmonton, there are times when I crave the comforting food of my childhood and most of my adolescence. Sadly for me, I haven't found a single place in Edmonton that sells goli baje (I am sure I would keel over with a heart attack if I did, I'd be eating there so often). I have found a nice South Indian place though, more on that in a later post. So coming back to my point, if I want goli baje I have to make them myself. Bah humbug, all that work!! So anyway, armed with a list of ingredients off my mum (I swear to God, she is so imprecise in her measurements, a bit of this and a bit of that, and yet her food somehow tastes glorious!!) I decided this afternoon was going to be my goli baje time. It gets dark early nowadays, and its so cold outside, it would be just criminal not to gorge full of comfort food! Or at least, that's my excuse. The ingredients are fairly basic, more often that not you will have them in your pantry at any given point. You do need to get a feel for the thickness of the batter though, but that comes very quickly with some practice. And hey, you can always add more water or flour without messing with the taste. 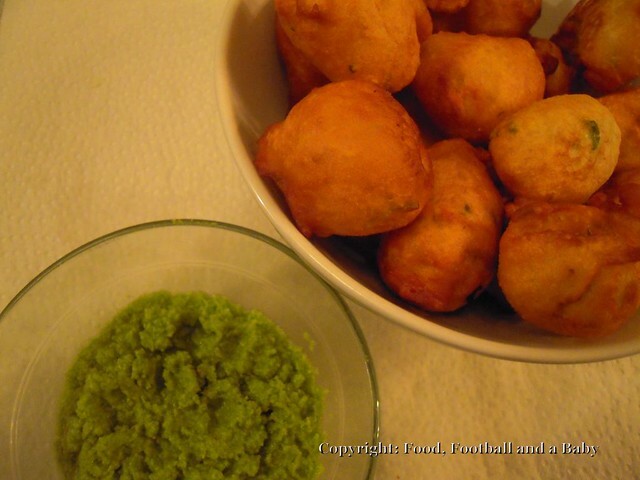 I served the goli baje with coconut chutney, recipe here. Around 1/4 cup water, plus maybe a little bit more. Stir in the ginger, chilli and fresh coriander. Let the batter sit for around 30 minutes or up to six hours. Or even overnight in a fridge. Heat enough oil for deep frying in a pan, until it gets hot enough that if you drip in a drop of batter, its should quickly rise to the surface covered in bubbles. Turn the heat down to medium. Drop in spoonfuls of the batter, not too much at a time, as the bajes will fluff up in the oil. Deep fry for roughly five to seven minutes, until they are a light golden brown colour. Don't worry if they are odd shapes and sizes, just adds to the fun! Using a slotted spoon, lift them gently from the oil and drain on absorbent kitchen paper. Repeat until the batter is all used up. Serve hot with chutney or ketchup and a hot coffee/tea. The bajes will be crisp on the outside and almost squishy elastic on the inside! Though we LOVED the goli bajjes from Woodlands. Mum often made them for us for breakfast,. And my favourite bits were the little strands that would break off during the frying and would turn really crisp. I know what you mean about the strands Kim, they're crispy and just delicious aren't they? 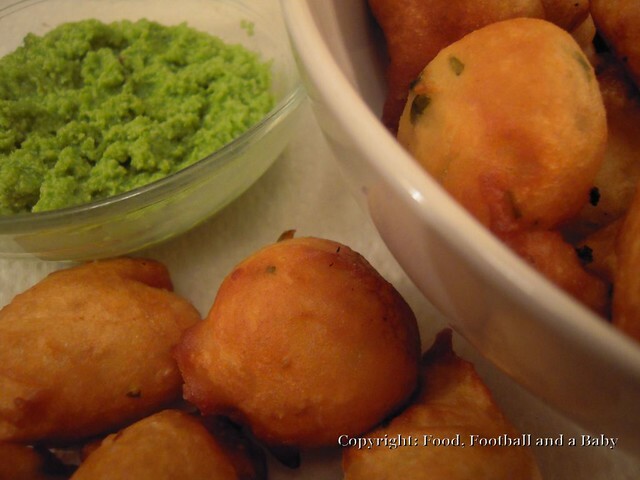 I use the besan as I feel it gives the baje a crisper finish on the outside. I have also tried it with just flour, and it tasted pretty good too, but it did take a bit longer to cook, and was a bit more squishy on the inside, if you see what I mean? I love deep fried food, but the waistlines can't take it any more, so I only keep it for winters and treats. No excuse not to eat goli bajes though, I always feel so homesick when I eat them. I've never seen these before made with yoghurt. I've had ones made with cheese. Deep fried delites. Oh give me these over a bucket of popcorn any day. But your right, best eaten during the winter season. my husband loved it. Thanks for sharing the recipe.